With the recent Nutrition Label requirements coming out last week, it’s the perfect time to do a virtual walk through the grocery store. A lot of people find the grocery store intimidating or a time-sucker [welcome in Instacart, Amazon Fresh and other delivery services], and they aren’t wrong. Our food culture has made grocery stores unbearable these days. Everything is difficult to understand and you have to be a scientist to understand the food you are buying. Enter food scientist. Well, dietitian, but a food expert is here for you! Slabbed on the front of all the packaging. Screaming at you. Letting you know the “positives” of that food product. But what do those labels truly mean? GMO, or Genetically Modified Organism, is any plant, animal or other organism that has been made up or modified in a lab. Many people choose to avoid products with GMOs as not much long term research on the affect of GMOs has been done. This is the same reason many people choose to consume GMOs. From a product standpoint, understanding this label is important, especially for grain-containing products. GMO wheat is not approved to be used commercially in the US, so when you see a bread bag with “non-GMO” stamped on there, that doesn’t mean it is healthier. Just means it’s real wheat. So those pastries aren’t better for you just with that stamp. Vegan does NOT equal healthy. I mean Oreo’s are vegan. So many products these days stamp that label on their packaging, yet they have a ton of sugar, sodium or preservatives in them. If you choose to be on a vegan diet, focus first on whole foods, with a variety throughout the day. For vegan food products, look for short ingredient lists and the amount of sugar and sodium in them [More on that below]. First the facts: Gluten is the storage protein within grains such as wheat, barley, rye and other grains. For those with Celiac disease, gluten is bad. But it isn’t inherently bad, as the media has made it out to be recently. As a protein, gluten is often what provides the protein in wheat containing products. So when something is removed [gluten], something must take it’s place or not take it’s place. This can leave a wrap or bread less nutrient dense than it’s gluten-containing counterpart. So Gluten-Free doesn’t mean healthier. Flip over the packaging and see the ingredients, looking for alternatives such as legumes, gluten-free flours such as almond flour and quinoa. This means that a product is 95% or more certified organic, meaning free of synthetic additives and was not processed with any industrial solvents. 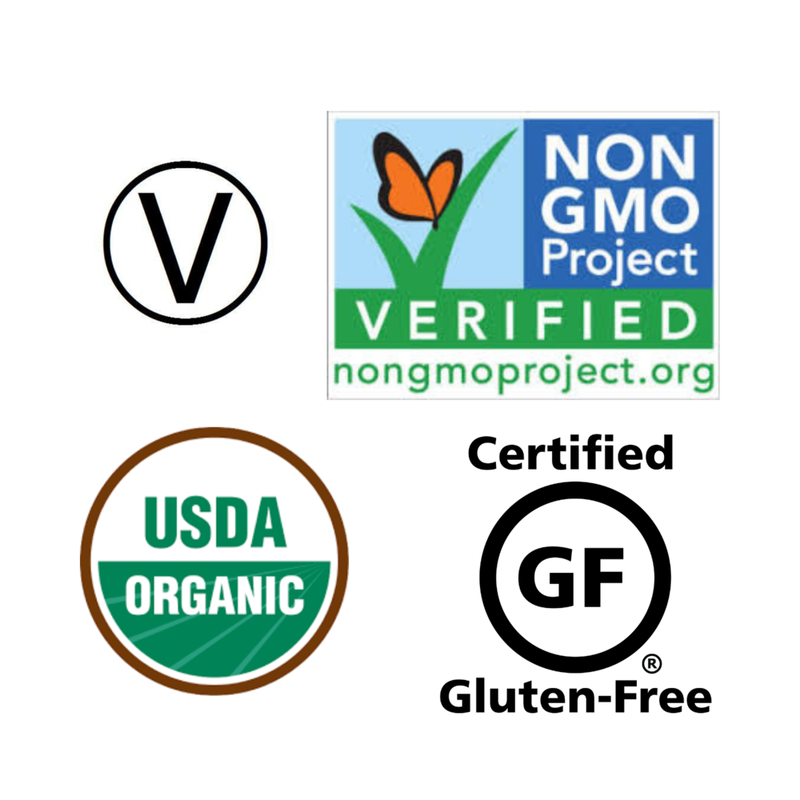 This certification is given by the USDA. This does NOT mean a product is free of sugar, salts or fats and can still be an unhealthy choice. Now bolder and easier to understand, the new label helps the struggle of portioning. And the serving sizes are updated to actually reflect what people realistically eat, which doesn’t necessarily mean healthier. For example, ice cream used to be 1/2 cup serving size. Now it is 2/3 cup serving size, so it will reflect what you ACTUALLY eat when look at the label. So the fat, carbohydrates and protein will reflect actual behavior. Keep in mind that serving size is a guideline to put things into perspective, not a hard fast rule. A new requirement for the Nutrition Facts label [Thank goodness!] so you will see this on most products now. What is added sugar though? It is sugar that is added during the processing or packaging of food, and can mean syrups, honey, concentrated fruit or vegetable juices. So sugar naturally in food like fruit and dairy does NOT count. The daily recommendation for added sugar is 6-9 tsp, or 24-36 grams. Vitamin D. Potassium. Iron. Calcium. All these micro-nutrients are low in the American daily consumption, therefore the FDA made them a requirement to be on Nutrition Facts labels now. For athletes, this is great news since all of these vitamins and minerals are proven to be linked to athletic performance and when consumed at recommended values, can increase and improve athletic performance. Read more on Vitamin D and Iron needs in athletes. This means that a food product has 1/3 fewer calories or 1/2 the fat of the original product. For example, dairy products use “Light” often to talk about half the fat from the original milk. Used primarily for vitamins, minerals and fiber, this stamp means that a food product contains 10-19% of the daily value in a single serving. These tips will help you navigate your favorite foods better and truly understand what you are purchasing. Next time you are at the grocery store, take a look at the food descriptors and the nutrition label. See if you can point out the little hidden “health” claims.